Your customers want a great experience, are you giving it to them? Today’s customer is aware, more informed, and expects an increasingly personalized service. Every aspect of their interaction with a company, product, or service affects the user’s perception and loyalty as a whole. By harnessing new technologies, cutting-edge companies are changing the way they approach customer and user experience. How can your business embrace this new generation, fluent in all things digital? Instead of focusing on the decline of old business models, this summit explores how companies can employ innovative techniques and tools which harness the exciting possibilities of digital technologies. 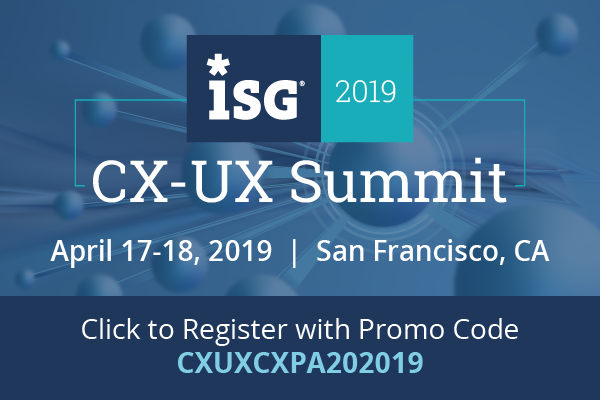 Register for the ISG CX-UX Summit to explore and discuss these future technologies that can transform your business. Sessions focus on automation, AI, brand reputation management, customer journey mapping, user experience & design, personalization, programmatic strategy, IoT, and more.